Today I read a fantastic book called A Balloon for Isabel by Deborah Underwood. Have you ever felt like you couldn't have something because you are different than everyone else? That is exactly how Isabel feels. All she wants is a balloon like all the other kids get but she is a porcupine. Porcupines have very sharp quills. If she gets a balloon, it would pop for sure! 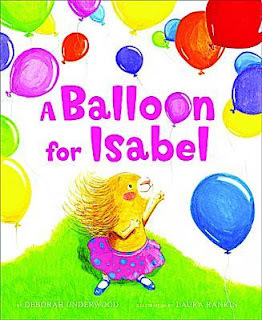 What can Isabel do to make sure she gets a balloon like everyone else? She will try just about anything!